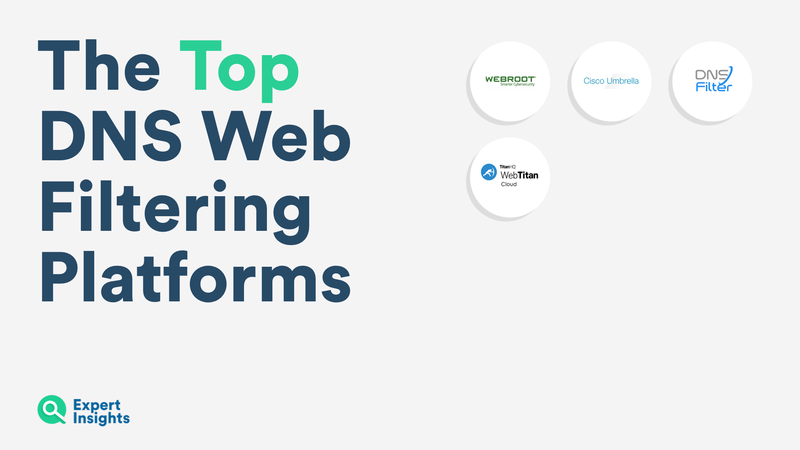 Discover the top 5 DNS Web Filtering platforms. Examine their features, security and reporting. Web security should be a top priority for your company. Websites can give hackers access to your private data, therefore keeping employees safe online is extremely important. One of the top ways to protect your networks from online threats is DNS based web gateways. This is because they protect businesses, by blocking online viruses and filtering dangerous websites. They also provide reporting of user behaviour online. The products are often very easy to manage and deploy. They offer protection for all devices, off-network and on-network. To help you find the right product, here’s Expert Insights’ list of the top Email Secure Gateways. We’ll discuss their effectiveness at web filtering, threat protection they offer, the quality of reporting and the admin controls. Webroot offers a fast, light and easy to manage service. It’s easy for clients currently using Webroot Endpoint Protection to upgrade to this service, which offers industry-leading web threat protection. They use machine learning and a contextual analysis engine to scan the web and identify threats. This means using this will greatly increase your network security. SecureAnywhere offers strong web filtering. It includes 80 categories of URLs that admins can set to be filtered for employees. This includes websites for gambling , gaming and adult content. The service monitors and logs employee activity in real time. This ensures they are safe from harmful web content. Webroot SecureAnywhere DNS protection is a low cost, but high quality service. It’s popular with MSPs because of how easy it is to deploy and how little support it needs once set up. We recommend this service to businesses looking for market leading threat protection, in-depth reporting and logging, and flexible admin policies. You can read our full review of Webroot SecureAnywhere DNS Protection here. Cisco Umbrella is a market leading DNS based web secure gateway service. It filters billions of webpages. They carry out advanced research intel into threat protection. This has greatly increased the effectiveness of their online threat protection. The admin controls they offer are highly flexible with multiple security policies to make sure everyone in an organisation gets the protection they need. Cisco offer a range of pre-made and scheduled reports. These are concise and offer you important visibility into your employee safety online. Cisco is easy to manage, offering admins three levels of content filtering. This allows you to set whether you want a low, medium or high level of filtering for your service. Cisco is a powerful and well liked by customers. It’s easy to install and deploy. We’d recommend it to companies who don’t mind paying a higher cost for an easy to use and trusted filtering service. You can read our full review of Cisco Umbrella here. DNSFilter is an elegant and streamlined DNS Web Filtering service. It’s a flexible service, driven by API. It is strong at protecting against web based treats, because it’s run by powerful machine learning algorithms. This ensures your network is safe from online threats. It offers strong URL filtering. Algorithms can be tuned to company policies, which determines which websites users have access to. One of the big strengths of DNSFilter is the design. It’s very easy to manage, and has an accessible UI. This translates over to the reports, which are concise and easily understood and navigated. The service offers off-network protection for clients who work from home. DNSFilter is a young platform. It’s lacks some features of competitors, but it is a growing platform, offering strong protection and an excellent user experience. It’s also very cost effective. We recommend this service if you’re looking for web protection which offers great protection at a good price. You can read our full review of DNSFilter here. WebTitan Cloud offers robust threat protection and it offers strong protection features. It’s core focus is on web filtering. It filters over 500 million URLs, and offers a comprehensive policy engine. They offer three great admin policies. Firstly, admins get 53 categories to set filtering rules. Secondly, they can also create their own filtering categories. Thirdly, they can use cloud keys. This is an easy method for admins to create exceptions to policies for individual users. WebTitan Cloud also offer blacklisting of DNS/domains. Reporting is another strength of this service. WebTitan offers a full suite of over 50 predefined reports. These have multiple exporting options. This is a popular service among customers for how easy it is to use and how effective the web filtering is.This service is also very well priced. We would recommend this service to clients looking for powerful web security, with strong web filtering and reporting- at a good price. You can read our full review of WebTitan Cloud here. SafeDNS a web filtering platform, that will work well if you are looking for a way to manage the content people using your Wifi network can access online. They offer businesses a range of strong web filtering features to stop people accessing content which goes against company policy. They also use categorisation to protect users from online threats such as viruses and malware, although this is not a core focus for SafeDNS in the way web filtering is. The service is a cost effective solution, that is easy to install and manage. SafeDNS is a much smaller company works with resellers so you can ensure you have a good level of customer support. SafeDNS is well suited to customers who are looking for DNS protection that works well with a low cost price, with rules they can easily set for all their internet users. You can read our full review of SafeDNS for Business here. So there ends our list of the top 5 DNS web filtering platforms. Each one brings unique features to the table, some offer powerful threat protection, whereas some great reporting and some offer a focus on web filtering. Finding the one that best suits the needs of your business is crucial for you to improve your security.